Being one of the best organizations, we are offering Logistic Service for Garments. This service is executed by our adroit professionals using best transportation facility and advanced technology. Our experts check all the quality parameters associated to this service and render the service by transporting our clients’ goods throughout this big country with our professional staff capable of catering to the needs of the precious clients. Besides, the offered service is highly admired by our clients for its cost-effectiveness. 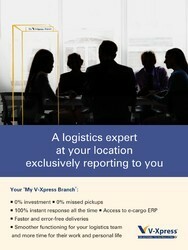 Looking for Logistic Service for Garments ?